Nov 1, 2018 - CWAers Vote to Keep Their Union! Iowa CWAers Vote to Keep Their Union! 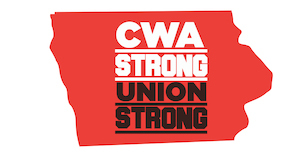 The votes have been counted, and all 21 Iowa CWA public sector bargaining units have voted overwhelmingly to keep their union! The vote was a massive, resounding win for Iowa CWAers against a Republican governor and state legislature that have been determined to gut workers' rights. Last year, Iowa Republicans passed a draconian bill to strip collective bargaining rights from public workers. In addition to banning public workers from bargaining on anything other than base wages, the legislation requires public sector unions to be recertified prior to every contract negotiation and institutes other extreme provisions to take away workers' rights. Bargaining units have to vote to retain their union approximately 10 months prior to the expiration of their contract. All of the 21 CWA bargaining units who voted to keep their union, including nurses, social workers, public safety workers, library workers, county employees, and school employees, have contracts that expire June 30, 2019, and can now proceed to bargain new contracts. This year, more than 90% of Iowans who voted in retention elections voted "yes" to keep their union, proving that this new law is a waste of taxpayer dollars only meant to try to weaken and bust unions. In the majority of cases, it has only made us stronger. Iowa workers are showing that they are willing to fight to keep their rights and have a voice on the job! This week, the New Jersey Assembly passed the "New Jersey Call Center Jobs Act," legislation supported by CWA to protect call center jobs by ensuring that companies that offshore New Jersey call center jobs to overseas locations do not reap the rewards of taxpayer-funded grants, loans, and tax credits. CWA members have been fighting to pass similar call center legislation at the federal level and in numerous states. Passed by a strong 51-23 margin in the Assembly, the call center bill now moves to the state Senate where it awaits action. The legislation, co-sponsored in the State Assembly by Democrats Shavonda Sumter, Dan Benson, Valerie Vainieri Huttle, Eric Houghtaling, and Benjie Wimberly, would create a list of New Jersey companies that move at least 30 percent of calls to overseas locations. Any company on this list, which would only apply to businesses employing more than 50 workers, would be ineligible to access to New Jersey taxpayer-funded state grants. The bill also would require that all customer service work done on behalf of the state is performed within the state. Call centers are an important economic lifeline for many communities in New Jersey and across the country. But thousands of call center workers have lost their jobs in recent years as companies have offshored customer service operations to cheaper markets overseas. This trend has harmed working families and communities, while endangering consumer security and hurting customer service. CWA submitted new comments on October 31 to the Federal Communications Commission (FCC) on the proposed T-Mobile/Sprint merger. The new filing finds that T-Mobile and Sprint have failed to show that there would be verifiable, merger-related public interest benefits that would outweigh the substantial harm the deal would cause to working people and consumers. "CWA's FCC filings make it clear that while the merger's harms to the public interest are predictable and well-documented, the supposed benefits of the merger remain highly speculative and unsubstantiated," said CWA Research and Policy Director Debbie Goldman. "The FCC should not approve this merger as presently constructed." While T-Mobile and Sprint continue to make vague promises that the merger will create thousands of jobs, the data and the companies' track records tell a different story. Updated analysis in CWA's new comments finds that the merger would result in the loss of approximately 30,000 jobs across the country – 25,500 job cuts from the elimination of duplicate retail stores and another 4,500 job cuts due to duplicate headquarters functions. The comments outline additional areas of concern with the proposed merger including the two companies' long history of labor and employment law violations; the loss of competition from the proposed horizontal merger; T-Mobile and Sprint's failure to prove verifiable public interest benefits that will result from the merger; and serious national security concerns regarding possible integration of Chinese government-owned Huawei and ZTE equipment in their networks. CWA has also launched a new website with information about the effects of the merger, including detailed state-by-state information about job loss. You can also stay up to date by following @TMSprintFacts on Twitter. 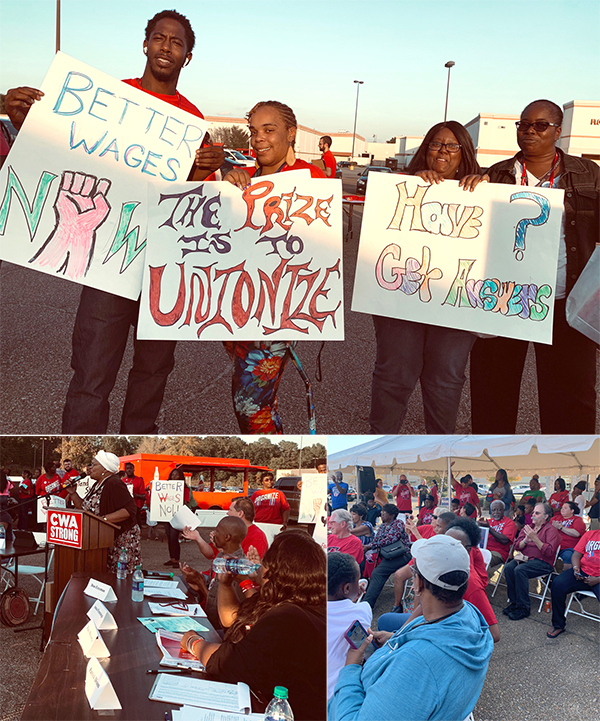 On Monday, hundreds of General Dynamics Information Technology (GDIT) workers who have been organizing to gain a voice in their workplace with CWA rallied outside their call center in Hattiesburg, Miss., against poverty level wages, calling for fair pay and a union. They were joined by State Representative Jeramey Anderson, Hattiesburg City Councilor Deborah Delgado, and other local elected officials, as well as members of CWA Local 3509. On the same day, Georgetown University's Kalmanovitz Initiative for Labor and the Working Poor released a new report showing that better pay at the Hattiesburg call center would inject millions of dollars into the local economy and help create hundreds of new jobs in the region. About 2,000 federally contracted customer service professionals work at the Hattiesburg call center. Most handle inquiries from Americans across the country about Medicare and the Affordable Care Act's Federal Insurance Marketplace. Despite the vital services they provide helping Americans get access to health care, most GDIT customer service professionals in Hattiesburg make only $10.35 per hour. "We deserve better than the poverty wages we are paid. Every day it's a choice about what types of sacrifices we have to make," said Anna Flemmings, a Tier 1 Medicare agent at the call center. "And it breaks my heart to constantly have to tell my son 'no' when he asks for something because we can't afford anything but the bare necessities." Due to these poverty level wages, many employees at the call center are forced to rely on public assistance and still struggle to scrape by. "No one working full-time providing essential services to Americans and doing complex and critical work for a federal contractor should be living in poverty," said Tracy Wolverton, a trainer at the call center. "Higher pay at the Hattiesburg call center would also mean more funding for our schools, more spending at local businesses, and economic growth in our communities." Earlier this month, GDIT announced that it is selling its call center operations, including its Hattiesburg call center, to Maximus, Inc. Maximus has informed the Hattiesburg call center workers that it intends to continue paying them the same poverty level wages as GDIT. On Monday, hundreds of General Dynamics Information Technology (GDIT) workers who have been organizing to gain a voice in their workplace with CWA rallied outside their call center in Hattiesburg, Miss., against poverty level wages, calling for fair pay and a union. 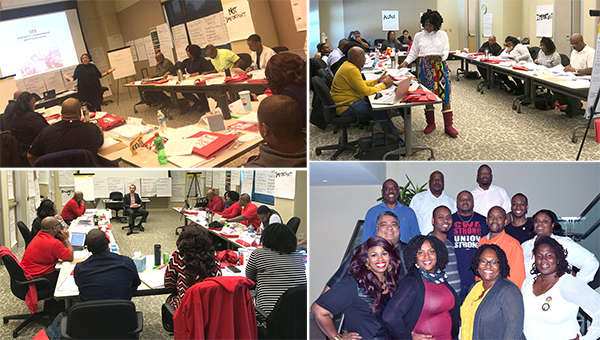 Last week, thirteen CWA members completed an intensive residential training program as part of the 2018 CWA Minority Leadership Institute (MLI). MLI was established in 1983 to increase the involvement of women and members of color at every level of our union. Each of the participants was nominated by their respective District/Sector Vice Presidents based on their continued dedication to the union and our labor movement. During the program, participants analyzed systems of oppression behind the challenges our country faces and explored the need for building collective power through transformative organizing. They sharpened their skills and learned new tools for effective organizing, legislative and political advocacy, communication, mobilization, collective bargaining, grievance handling, and arbitration. Participants developed work plans detailing how they will incorporate their training into their ongoing work at the local level. Class sessions were led by union leaders including CWA Secretary-Treasurer Sara Steffens and Assistant to the President Ameenah Salaam. CWA District 6 Vice President and head of CWA's Human Rights Program Claude Cummings, Jr., joined the participants for their graduation ceremony. During the ceremony, class members shared their renewed motivation and their excitement about applying their training into their ongoing work in their local unions and communities. CWAers gathered last week for the 2018 CWA Minority Leadership Institute (MLI). Group photo, bottom right: Top row, left: Byron Hoskins, CWA Local 6327; Lawrence Baker, CWA Local 4217. Second row left: Tim Fitzgerald, NewsGuild-CWA Local 32035; Eric Jones, CWA Local 6215; Christian Stephens, AFA-CWA Local 21085. Third row left: Jorge Lara, NABET-CWA Local 54041; Miguel Scoby, CWA Local 9400; Steven Chambers, CWA Local 2201; Ebony Adkins, CWA Local 1040. Bottom row left: Andrell Hubbard, CWA Local 3902; Celeste Jones, CWA Local 7901; Kendall Bell, IUE-CWA Local 81381; Misty Lammons, CWA Local 1033. On Thursday, Envoy passenger service agents, members of CWA, rallied outside of Dallas/Fort Worth International Airport for a fair contract and against poverty level wages. CWA District 6 Vice President Claude Cummings, Jr., and Rep. Toni Rose (D-Texas) joined the workers at the rally. Envoy agents are calling on management to negotiate a fair contract, including wages that reflect the work they do in supporting passengers and flights for parent company American Airlines. The next bargaining session is set to begin on Tuesday, November 6. What AT&T CEO Randall Stephenson has been doing to harm working families and our communities is scarier than any Halloween costume! 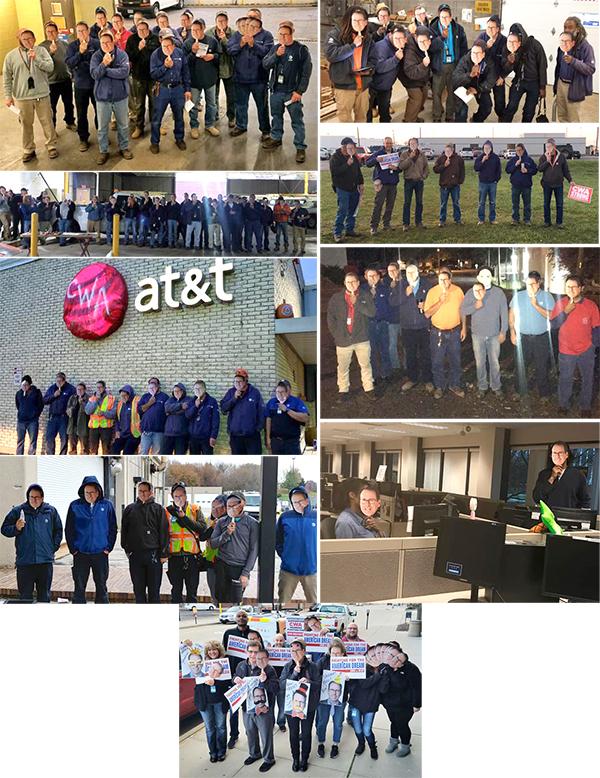 On Halloween, CWAers across the country mobilized to show AT&T that they're ready to fight for a fair contract. 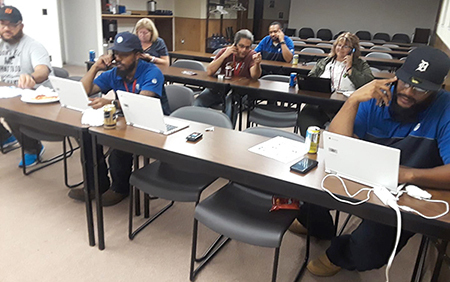 CWA Local 4009 has been hosting phone banks to get out the vote for pro-worker candidates including Gretchen Whitmer for Governor and Elissa Slotkin and Andy Levin for Congress. 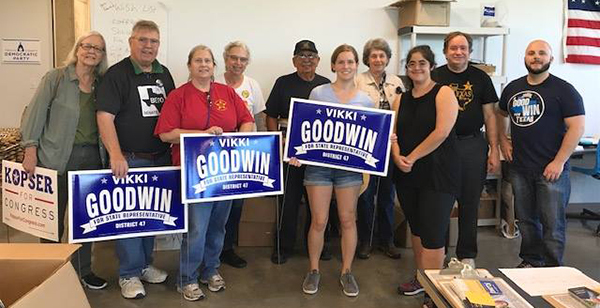 Members of TSEU-CWA Local 6186 have been knocking on doors and making phone calls to elect strong candidates for working people including Vikki Goodwin, Julie Johnson, James Talerico, Philip Cortez, and Leo Pacheco for State Representative. 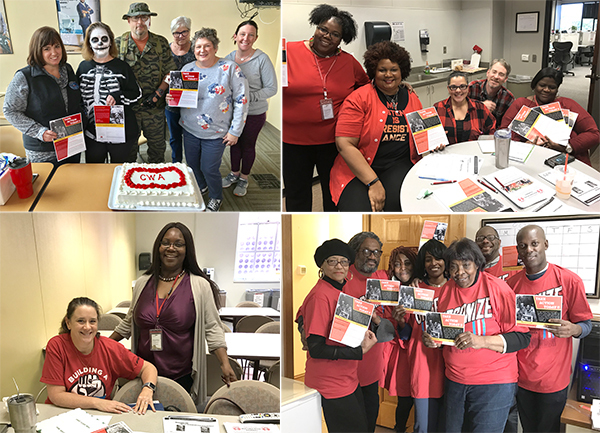 Members of CWA Locals 13000, 13500, and 13301 have been working hard to get out the vote across Pennsylvania, including holding labor walks in Harrisburg and Lancaster, and phone banks in Pittsburgh. Members of the CWA Arizona Retired Members Council have been working hard to help re-elect Ruben Gallego and to elect David Garcia for Governor. 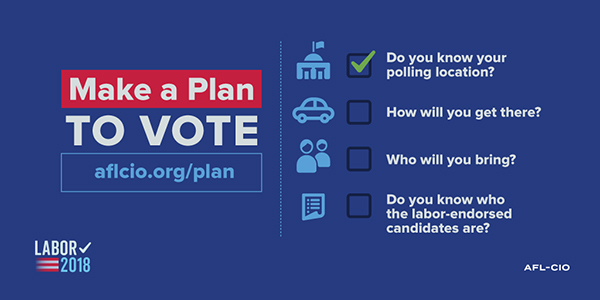 The AFL-CIO has a new tool to help you and your friends and family find your closest polling place, figure out if early voting is available and where, and even receive text or email reminders about voting – including updates if your polling location changes. A unit of 23 South Carolina AT&T Mobility Cellular Technicians voted to be represented by CWA. Local Presidents Tom Mullane (3702), Steven Auerbach (3704), Debra Brown (3706), Allan Poston (3708), Patty McLeroy (3710), Jason Laporte (3716), and Mike Haviland (3207) were all instrumental in the organizing efforts. CWA this week announced its support for "Yes on Measure B," a proposed amendment to the city charter to establish the Public Bank of Los Angeles. The Public Bank of Los Angeles would safeguard the city's assets while providing essential financial services that keep the public's interests front and center. "Big for-profit banks and Wall Street interests have proven time and time again that they don't have the public's interest at heart and they remain too often unaccountable and unresponsive to the needs and concerns of taxpayers, consumers, and their own employees alike," said CWA District 9 Vice President Thomas Runnion. "We look forward to supporting the 'Yes on Measure B' effort in the homestretch of this election season."